The Department of Health announced last week their intention to halve the rate of E. coli BSI by 2020. Whilst this is a move that should be embraced, it will be an enormous challenge to achieve. The reduction that has been delivered with MRSA BSI could be seen as a model for success (and I suspect that if you were a politician, you would see it this way). However, it is vital to recognise that E. coli BSI and, more broadly, Gram-negative BSI (GNBSI) are not the same as MRSA BSI, and will require a different reduction strategy. It is worth considering why the government have made this announcement. There seems to be two problems for the price of one with E. coli BSI: firstly, an increasing number of cases in England (see the Figure below), and secondly, an increase in the levels of antibiotic resistance. The recent ESPAUR report tells us that resistance to piperacillin/tazobactam (the most frequently used antibiotic for the treatment of sepsis) increased in E. coli from 8.5% to 11.7%, and for K. pneumoniae from 12.6% to 18.5% between 2011 and 2015. The increasing trend in the number of E. coli BSIs is perplexing. Could this reflect a changing, aging population, be a case of increased ascertainment, or, and I hesitate to even mention this as a possibility, a verschlimmbesserung of reducing antibiotic use in primary care (especially ciprofloxacin / augmentin) resulting in more E. coli BSIs? Whatever the reasons for these changes, the sheer number and levels of antibiotic resistance in E. coli are rising, so I can see the reason for the increased focus on prevention initiatives. 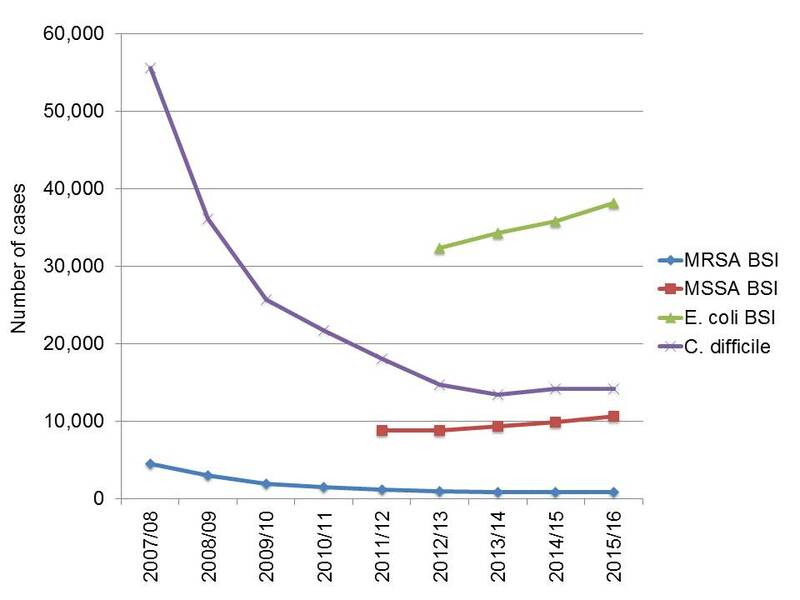 Figure 1: The number of cases of MRSA, MSSA, and E. coli BSI, and C. difficile reported in England, 2007/8 to 2015/16. Data from PHE. It is not clear what effected the remarkable reduction in MRSA BSI. However, it seems pretty clear to me that the reduction was linked in some way to the bundle of interventions that were implemented, since the change in rate correlated so closely with the reduction targets. I also think it was interventions targeted towards MRSA rather than general improvements in IPC practice that made the impact – otherwise how do we explain the static and perhaps even increasing rate of MSSA BSI? I think there are a few key areas of difference between MRSA BSI and E. coli BSI when it comes to formulating a reduction plan. E. coli BSIs occur on a different scale to MRSA BSI. Even at the height of the MRSA epidemic, there were less than 5000 cases per annum each year in England. There were almost 40,000 cases of E. coli BSI in England last financial year (see Figure 1). E. coli BSI is only part of the GNBSI story. The story around multidrug-resistant Gram-negative bacteria is long and complicated, involving multiple genus-species-gene combinations, in comparison to the relative simple single genus-species-gene combination for MRSA. Given that the announcement from the government began by talking about GNBSI and spent the rest of the announcement talking about E. coli BSI, it is not clear to me exactly what the aspirational target will be! Do we have enough data to start measuring accurately a reduction in all GNBSI? The mandatory surveillance scheme currently only includes E. coli, so would need to be expanded. Finally, E. coli BSIs are in many ways not the most important part of the story. I am more concerned about K. pneumoniae BSIs. K. pneumoniae is better at spreading in hospitals, more likely to produce a carbapenemase enzyme, and in most cases a more virulent pathogen. The epidemiology of coli BSI and MRSA BSI is fundamentally different. With the exception of the emergence of community strains of MRSA in some parts of the world, MRSA it remains largely a hospital organism. E. coli, on the other hand, has a firmly established community reservoir. In this respect, it is more like MSSA – and it is worth mentioning again that the interventions that reduced MRSA so spectacularly have done nothing to reduce MSSA. This means that a reduction plan focussed exclusively on tertiary care in acute hospitals will not be especially effective in preventing GNBSI. What I am not saying is that an increased focus on GNBSI is anything other than a positive step forward. Personally I would also embrace a reduction target to focus our minds. However, we do need to be clear that reducing E. coli and GNBSI in general will require a broader prevention initiative across a wider spectrum of the healthcare system. Excellent blog: “There were almost 40,000 cases of E. coli BSI in England last financial year”. What part was community-acquired? And how on earth (or on an island) do they think you can reduce community-acquired GNBSI? Vaccination? SDD in drinking water? No more microbiology diagnostics? Thanks Marc. PHE make no distinction between hospital or community-associated E. coli BSI (whereas they do for MRSA and MSSA BSI, and C. difficile). I am sure that, as you say, a healthy majority of E. coli BSIs have nothing to do with in-hospital transmission – or in-hospital anything really – so perhapps SDD in the drinking water is the way to go. The terms E. coli BSI and Gram-negative BSI are used almost interchangeably. Whilst one explanation is that we are to start with reducing E. coli, and then progress to other GNBSI, perhaps a more plausible one is that the people making these decisions simply don’t realise that the former is actually a subset of the latter? So far, all we have seen or heard about actually amounts than little more than a plan to collect even more data. Although an important first step, that is not the same thing as a plan to tackle the problem. . MRSA BSI at its peak was largely a hospital issue- (although I share your scepticism about what it was that actually made the difference). Given that the vast majority of E. coli are community acquired, we won’t get anywhere unless GPs, the CCGs and social sector are ACTIVELY involved. E. coli BSI will not be reduced merely by placing even more of a burden on hospital-based microbiologists and IPCTs. We don’t even need to ask as to whether there will be any resources made available to make this happen. What we really need now is a strong lead from Ruth May and/ or PHE on what to do in order to reduce rates- preferably more than simply increasing community prescriptions for broader spectrum antimicrobials, which we have worked so hard to reduce. Sadly, without such a lead, that is the one thing which seems bound to happen. Thanks Jenny. Yes, I too was struck with the apparently interchangeable use of GNBSI and E. coli BSI in the announcement. I hope there is full recognition of the fact that E. coli BSI is a subset of GNBSI, and that the first step to tackling GNBSI on a national scale would be a GNBSI mandatory surveillance programme! The announcement does beg the question as to who the NHS is seeking advice and input from on these new strategies? Appears to lack input/direction from some of the key stakeholders including infection control practitioners, microbiologists, infectious disease physicians and GPs.